In 2017 international tourism grew by 7% with 1,322 million world travelers, and that number is expected to grow in 2018. Now more than ever, sustainable tourism has taken a front seat in the global crusade against environmental degradation and climate change. We had the chance to hear from Flemming Konradsen, a professor of environmental health at the University of Copenhagen, who has more than twenty years of research and programming experience in the field of environmental and global health. He is also the director of the School of Global Health, University of Copenhagen, and teaches Sustainable Tourism on Coursera. What led you to create this course? I’ve been working in the field of global health for many years in Asia and Africa and I currently teach Introduction to Global Health on Coursera which has been running since 2013. The same places where I’ve been working in global health like Asia and Africa are also areas where tourism is growing rapidly so it was a relevant next step for me to teach in the area of tourism. We see pronounced impacts on human health and the natural environment resulting from the unregulated growth in the tourism sector, especially in small island states. Many of the most desirable destinations harbor some of the world’s most vulnerable ecosystems. A poorly regulated tourist sector that is designed with limited economic benefits to the local communities can place an unprecedented pressure on the resources and future sustainability of such destinations. If we build a sustainable tourism sector we can combine economic development and minimize the negative environmental and social impacts of tourism. There’s a brief introduction to tourism, but the focus is on the impact of tourism on low-income countries with a primary focus on small island states. We are very much focusing on issues related to waste, freshwater resources, marine water quality, use of insecticides for pest control, and solid waste management – classic environmental health issues that are being impacted by the rapid growth in tourism year after year. However, we do also discuss the wider topics and potential solutions related to sustainable tourism certification schemes, pro-poor tourism and global initiatives to regulate the sector. I will also discuss environmental health and natural resource management challenges associated with the rapid growth of tourists visiting low-income countries. Since infrastructural and regulatory capacities in such countries are often limited they are more exposed to the negative implications of such development. This course is for everyone, especially those who travel to tropical and subtropical regions of the world. Our goal is to make tourists aware of their carbon footprint and be conscious of that when booking their next vacation. 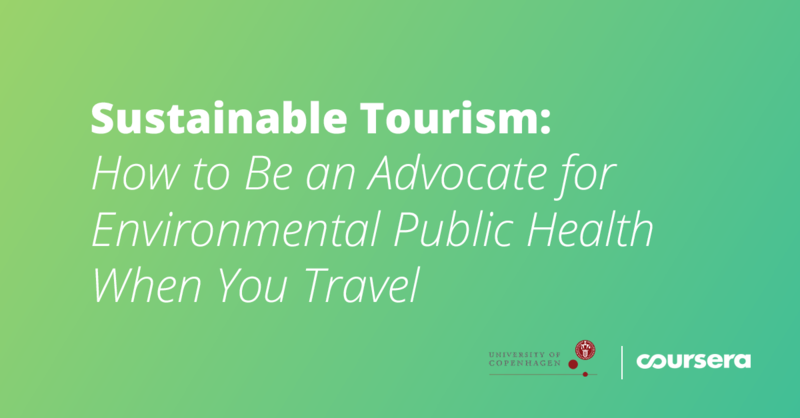 As tourists, we should all be asking our tour operators, “Have you considered sustainability?” It’s important for consumers to ask questions and demand answers on environmental and sustainable issues when they book their travel. We have also included literature and resources that can help professionals in the tourist sector create this kind of change. In this way, we hope to provide an opportunity for the front-line professionals working in the tourism sector to gain access to continued education on issues of sustainability. What can someone expect to learn from this course? Learners will be able to define sustainable tourism, analyze the environmental health impacts of tourism development in resource-poor settings in the tropical and subtropical regions of the world, and identify strategies towards a more sustainable form of tourism, with an emphasis on solid waste, wastewater, water resources management, and pest and mosquito control. If as consumers we demand services that are more sustainable, there’s a chance for sustainable tourism to grow further. It’s an uphill struggle because it requires policy change, consumer interest, and technology. There are too many small islands that can disappear because they can’t sustain life with no usable water and compacted waste. There’s no option other than pushing for a more sustainable agenda. Enroll in Sustainable Tourism here.